I mean honestly, those faces are just ridiculous!!! 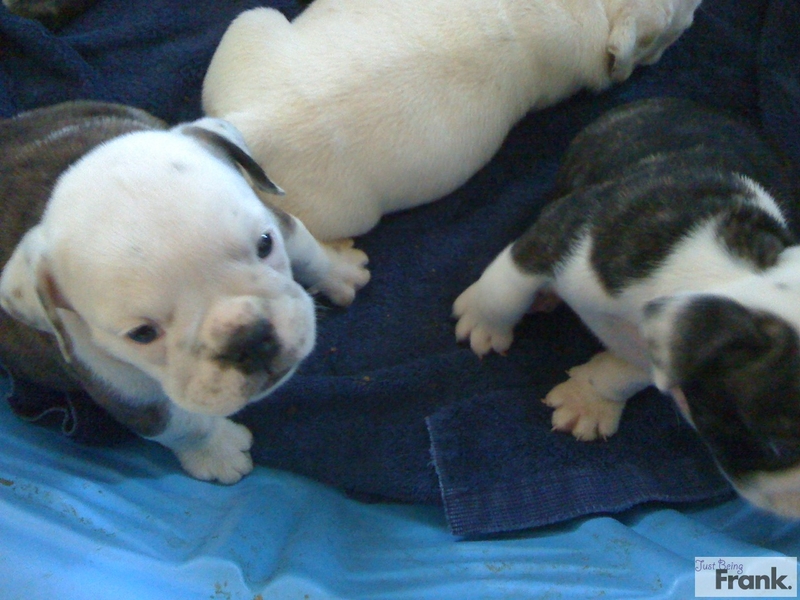 I would take every single one if I could. And you know that's not a lie. But I can't. 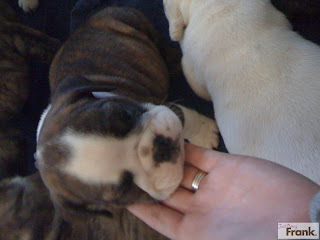 These puppies belong to a friend of mine, who bred her two English Bulldogs. The parents are great dogs, and they puppies have been raised with lots of TLC. Now....do you want one??? Let me know if you, or someone you know is interested, they are up for adoption and will be ready for new homes mid October! Could you just die, they're too cute??!! 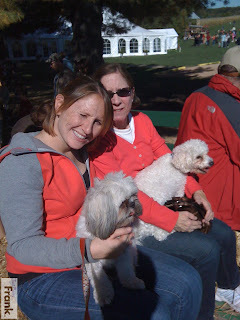 And such wonderful dogs! 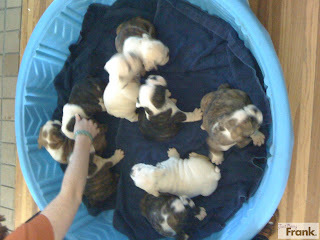 So not a half bad weekend...I got to play with baby bulldogs, what could be bad about that!? Pretty darn sweet. And then we picked some apples with my parents. Lots of apples. It always seems like such a good idea to go..and pick apples. And you need to buy the big huge pick your own apples bag. You have to pick a lot. You can't get that small wimpy bag, if you're there to pick apples, you're going to pick some serious apples. And in my case, I even filled my purse. Yes, that's right, if I'm going to pay $20 for a plastic bag in which to fill with apples that you have not even removed from the tree for me, I'm going to fill the Cole Haan purse with a few more apples dangit. And then you go to the gift shop, maybe buy some apple paraphernalia, ya know, an apple corer (because you can't find that at Target for 1/8 the price), and a frozen, unbaked apple pie (which will promptly sit in your freezer for 2 years), and a soup mix (which looked so good you had to buy it, but you will never actually make). And you drive home, tired, but happy with your pickings. An entire car full of apples, apple paraphernalia, and hay stuck to your behind from the hay ride. And as you drive you think of how happy are that you have all of those apples. And you imagine all of the apple things you will bake. And the apples you will have with your meals. And then you arrive home to remove said apples from your car and realize. WTF. Why did I just buy 50 pounds of apples, and what the hell am I going to do with all of them. In our case, since we live in a shoebox, they actually did not even fit into the refrigerator. So, an entire bag is still sitting in my car. Car full of apples. But I will enjoy them. And likely will be baking up an apple storm this evening. If you want puppies or apples, give me a holler.